This week, I’m struggling. Daylight savings time, hormones, and insomnia make me wonder why it’s only Tuesday. It’s rather hard to go to bed when the sun is still out and then rise when the sun is still sleeping. So having made caramel sauce for the tenth time, and being driven half insane by the ringing phones in my office, I’m taking a break to reflect and write. Anyway, there I was, petrified. Circling the area, looking for another way. But every other way just looked even more daunting, even more impossible. Thankfully, I have really nice friends who didn’t just leave me to die alone. Somehow, they helped hoist me over that tree to safety. I remember though, as I was struggling to get over, my friend told me that I was physically capable of getting over, and it was just a mental block. And when I got over, she told me I could use the experience in my writing. So here I am doing just that. Turning the whole thing into one, big analogy. Because that’s what I do. My days usually go something like this: alarm sounds prettily and loudly, I find my way through the dark as I stumble around, trying not to step on Miss Aura the Cat, and then I get ready for work and drive pre-dawn through traffic, never making eye contact with the sunrise. I pray for strength to get through the day. Just one day. One more day. (Enter music from Les Mis). Until the weekend comes. Another week gone, another week to cross off my to-do list of life. I find myself feeling stagnant, dazed, a little lost. I feel frozen, rooted to the ground, afraid to move forward. There’s a mental block. A giant tree standing in my way, and I’m too afraid to try getting over it. The lonely, cackling voice inside my head whispers poison in my ear. “What’s the point of writing? Why do you continue when you know no one reads it? No one cares. No one notices. 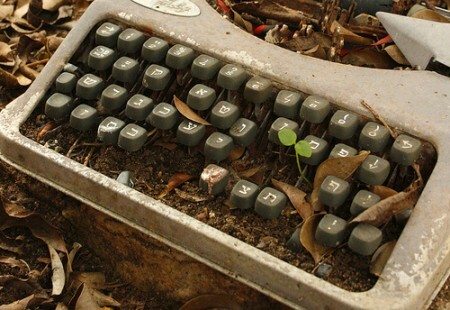 You’re writing for an audience of one.” A tree falls on an endless page of words, and I lose the courage to continue. I can’t think straight. All I can think of is how stupid these words sound. And words fail. Writer’s block ensues. I see the clouds of doubt hanging over my head. Clouds of the everyday mundane. Responsibilities piled up so high in a messy clutter that looks impossible to get over. Robotic movements day in and day out. I become lost in an endless cycle of purposelessness. Purpose block takes control. I forget that there’s a greater goal. I forget that I’m called to a greater purpose, that I was created by the Almighty One, and that His plans are greater than mine, that His ways are better. All I can see now is tree after tree, boulder after boulder, blocking the path that I wanted to take. Life blocks in the form of discontent, unfulfilled dreams, envy as I watch everyone else get past their road blocks and move onto dream vacations, perfect weddings, beautiful babies. It’s easy to allow impossible-looking situations overwhelm you. Especially when you’re listening to the wrong voices. The voices that don’t matter. The voices that put you down, including the inner voice of doubt. Once upon a time, my crush from a thousand eons ago told me, “Those who mind don’t matter, and those who matter don’t mind.” I thought he was really smart at the time, until I looked it up and realized he got it from Dr. Seuss. Well, that guy was smart regardless, but that’s beside the point. That guy is no longer a great part of my life, but I still think often of the quote. Because it reminds me to listen to the right voices. The voices that encourage instead of the voices that criticize. The voices that lift me up instead of the ones that put me down. To remember not to be overwhelmed by the mean people out there because there are those who care about me. And even if all the people out there fail me, to remember that the One who matters most is God. He doesn’t mind that I’m me because He created me. He’s the most patient with me, despite how many times I fail to trust Him. He’s the one who will ultimately help me overcome all blocks in life. And I must remember most of all that my purpose in life is to please God, to work for His glory, not for mine.